Our daughter went to your academy this year. It was her first time on s residential retreat and she absolutely adored it. She said it was the highlight of the summer. Given that maths is not her favourite subject you should clap yourself on the back for giving her such a positive experience . She is now your greatest advertisement and I am getting many enquiries . May have to negotiate some commissions for next year !! You can take it we will be returning . I really want to thank you and all the team about the wonderful week Nicolas had in Rockwell camp. We surely think he’d like to come back, and maybe next time his sister too. Have a great vacations and thank you again for your great job! I wanted to thank you for this first week of. I only heard good things from C of your camp, your hospitality and the friendliness of the other mates. She is meeting new people from different countries and she is very happy with her new friendships. She also enjoys most of the activities she has performed: Robotics, Surf, Zip&Trek etc.. and she is learning so many things. “Hi Aengus, Thank you very much for a wonderful two weeks. We saw the videos everyday and are delighted our son had this incredible experience. See you next year!” UCorrel. “Hi Aengus, the first thing my girls said, even before hello, was ‘Can we come back next year?’!” Sergio. You can also check out WHAT THE PRESS SAY! Irish camp was compared to a French camp. Asked him his favourite bits? He said music making and kayaking and meeting the different people – says they are on Instagram now and that he would show us a few (science) things he learned when we meet up in a few weeks. Guess that was a success then – thank you to you and your team! L… loved the camp and wants to come back again next year so that says it all I think! Thank you and your team very much for looking after him. He’s spoken endlessly of Chuck and how great he was and yesterday he tried to do one of Chuck’s experiments at home! 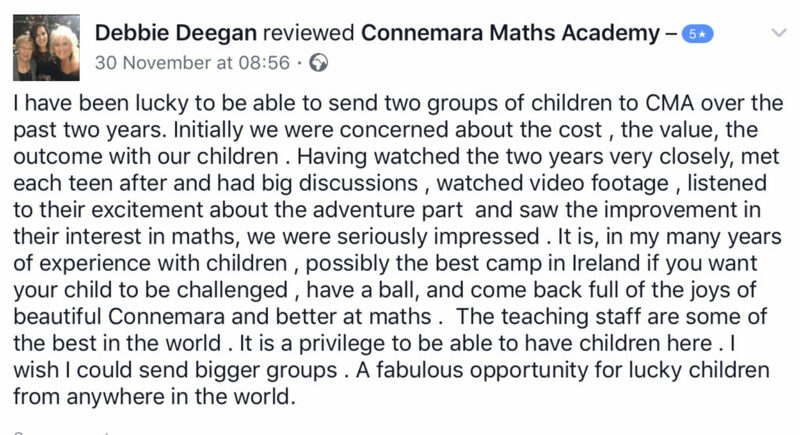 A belated but sincere thank you to you and the staff of Connemara Maths Academy. Our daughter A… attended the camp in Kylemore Abbey in June and loved every minute of it. Apart from the most wonderful of locations, the activities were engaging, fun and helped the students see the world through ‘maths’ eyes’. Her teachers on the course were very encouraging. She particularly loved the music technology, robotics and sailing elements of the week. A… has always had a passion for maths and science and this week really increased her confidence and opened her eyes to the possibilities re taking maths further. We are very happy with how the course was organised. The students were gainfully occupied for the whole time. There seemed to be an excellent balance between class time and fun time! The standard of accommodation and food was also excellent. Our thanks in particular to Josie – I’m still hearing about how wonderful her baking was & how kind she was to the students. Once again, to you and all of your staff in Connemara Maths Academy sincere thanks. Aoileann hopes to be back with you again next year! Wishing you every success with this project. “Good morning Aengus, How are you???. I don´t know how to express our gratefulness because [my son] enjoyed a lot in your summer camps in Killary. We will see next summer again…I have seen the pictures and it was really exciting. My son’s sister, aged 12 next summer wants to go. I am going to check in your website if there is any camp for her. “Aengus, Congratulations on the camp and to have chosen Beatriz to be with the children…she is really lovely and very kind!” Parent of student at August Summer Camp Killary. 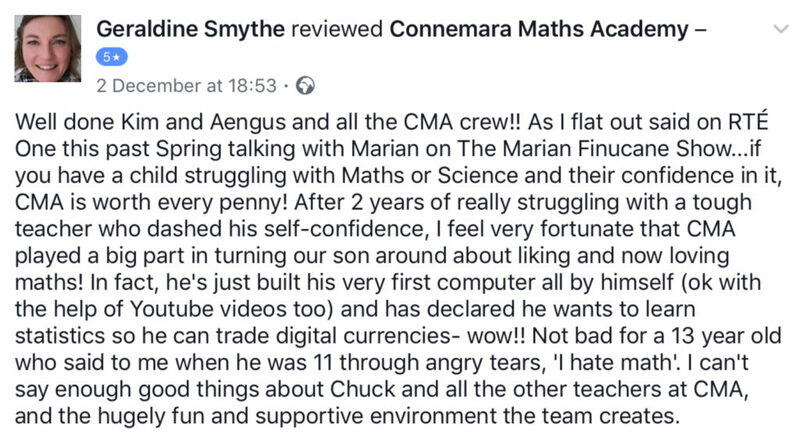 “it’s hard to match the fun he had at Connemara Maths Academy. We have talked about it daily since and have enjoyed watching the video clips on youtube. You and your team should be so proud of the package you have put together. You set yourself a challenge to inspire teenagers with maths but you did that and so much more. We were looking for a summer camp for our 14 year old Son and found CMA . Without a doubt it is the King of Summer Camps. What a creative way to rediscover maths and learn how to apply it to life in a fun filled, energetic and inspiring environment. 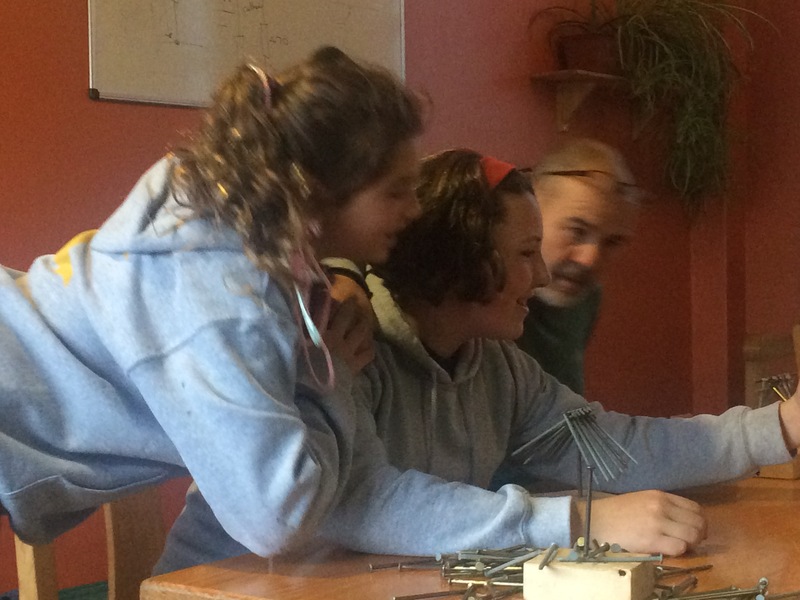 As the days passed and we were updated daily on Facebook and Flipboard we started to wonder if there were more than 24 hours a day in Connemara as the days were full of activities and the photos full of smiling teens and their leaders. 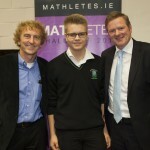 Photo: Séan O’Sullivan, SOS Ventures with Connemara Maths Academy Founder Aengus O’Connor with annual Scholarship recipients Luke McMahon (2014) & Frans Rosti (2015). CMA present a scholarship to one lucky student every year at the annual Mathletes Final. 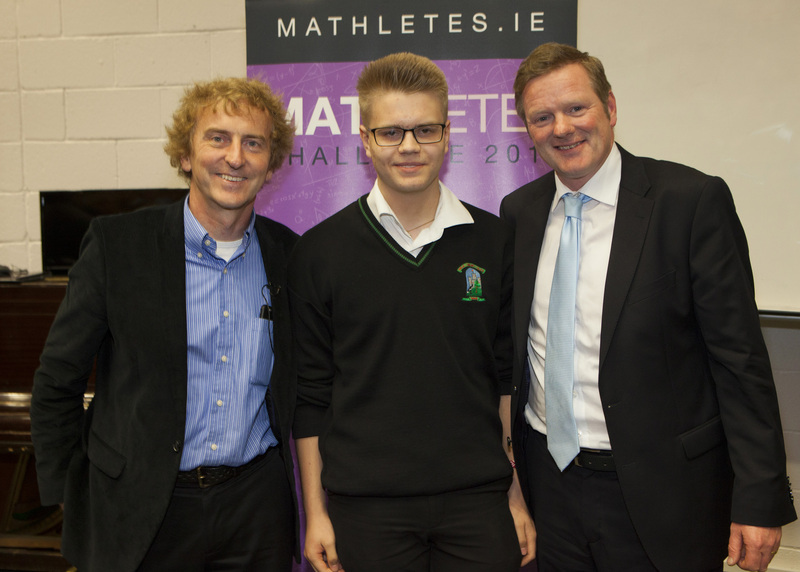 the Scholarship is open to all participants of the Mathletes Final Day in May. Many students have an uncomfortable relationship with mathematics which can result in a weak understanding of key mathematical concepts, limiting subject selections, narrowing career choices and stunting academic growth; in many instances the effect can last for life. Project Maths has been designed specifically to combat such problems and while there may have been some resistance to this initiative, CMA regard this as a great opportunity for students to expand their horizons, and fits very well with our ethos and educational philosophy. Project Maths is ideally suited to this ethos and our students benefit enormously from our total immersion programmes. Students can become confident in their ability as creative thinkers and succeed in their studies, no longer dreading the mathematics curriculum or any of the mathematically related subjects they may be studying. At CMA our aim is to overcome these issues, enabling students to free their minds of the rote learning shackles and to become inspired, creative, problem solving students where mathematics becomes a happy and joyful experience, fluency in key concepts becomes a reality and career choices expand enormously. We encourage students to learn through discovery, language and visualisation while making as many world and real life connections with the key mathematical concepts as possible, paving the way for students to acquire a more fluent and confident approach to mathematics and other related subjects. The Key Fundamental Mathematical Concepts that underpin the Junior and Senior Cycle mathematics syllabus are presented to students in dynamic and interactive classrooms, with a strong emphasis on facilitated learning, group work and stimulating technology centered lessons. ‘Máthēma’: ‘that which one learns’. Learning through Discovery and Visualisation. ‘Máthēma’, the ancient Greek word means ‘that which one learns’ and in modern Greek simply means ‘lesson’. There have been many other definitions since then such as Aristotle’s definition ‘the science of quantity’ up to as late as 1870 with Benjamin Peirce’s ‘the science that draws necessary conclusions’. Whichever definition one prefers, mathematics can be seen as a fundamental philosophy whereby people can understand the world around them enabling them to aspire to be masters of their own destiny, whether it be through a university degree they would ideally like to complete or a career they would love to follow or a business idea they have and need to be equipped to pursue. Fluency, Confidence and Success When students have grasped the key concepts and are comfortable with them, their career choices are increased many fold, leading to happier and more satisfied citizens. Regardless of whether a student has an academic career path in his/her sights or perhaps a career in a trade or business, having a fluency in the key mathematical concepts will go a long way to achieving these goals. Through our technology centered and facilitated learning workshops and lessons, coupled with our commitment to fluency and confidence in the key concepts supported by our mathematically connected physical and artistic activity based curriculum, students will complete our courses with a renewed enthusiasm for learning and a crucial confidence in their own mathematical ability. CMA Founder & Director Aengus O’Connor B.Sc., D.L.S., M.Phil., P.D.E. has over 20 years’ experience in education, at both Post Primary and Third Level, nationally and internationally, including as Education Consultant (Technical Bridging) with Saudi Electric; Maths Specialist with the Abu Dhabi Education Council; School Director with the International School of Choueifat Damascus, Syria; Course Director, Senior Lecturer and Head of Audio at the Technology Innovation Centre, Birmingham City University, UK; Project Leader and Head Teacher with the Italian Ministry of Education; Head of Music at IST, Turin, Italy among other roles internationally while also having extensive experience teaching mathematics at Post Primary and Third Level in Ireland. Aengus has worked in many different educational systems including Junior and Leaving Certificates, IGCSE, A Levels, International Baccalaureate Diploma, SAT, AP, Sabis System, Syrian National Baccalaureate and Brevet examinations, and draws on this experience when designing and delivering courses and programmes of learning. Aengus has also worked professionally for many years as a media and sound technologist, electric acoustic composer, producer and musician and brings these experiences to our courses and programmes of learning. This unique approach fosters a stimulating and uniquely dynamic learning environment where students can connect with the key mathematical concepts in many diverse and interesting ways, paving the way for real and meaningful mathematical understanding, where students may gain fluency, confidence and success. Credits: U2 (live at Freedom of City, Studio: ‘Sweetest Thing’); DARA, Sony Records, Abbey Road Studios, Producer Mike Hedges (Manic Street Preachers, Texas); Arranged, Conducted & Recorded Orchestral Score with George Higgs for the Soundtrack of ‘Park’ 2000 – feature film Premiered at Dublin Film Festival, Samson Films, Directed by John Carney (‘Once’ – Oscar Winner, ‘November Afternoon’ – RTE); Dublin Screen Orchestra (co-founder) – Orchestra Soundtrack For The Quiet Man; City Lights Screen Orchestra (co-founder) – performed a newly commissioned score to a screening of Nosferatu, Opening Night Dublin Film Festival, Rückert Orchestra (founder).